Built around smooth, secure hydraulic height adjustment, the On-Stage KB9503B piano bench offers unparalleled stability, comfort and convenience. 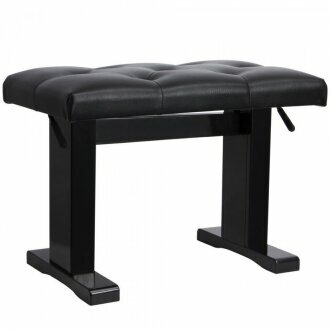 Easily accessed levers beneath either side of the premium-tufted bench adjust height from 17"- 22", while the black gloss finished base combines rock solid functionality with production-friendly optics sure to compliment any performance. - Height Adjustment from 17"- 22"